Record created by De Jackie Inspirations as Listed in the Malaysia book of records with total Size 46.1 meters x 18.1 meters. Brought to you by : Boulevard Shopping Mall, The Malaysia Book of Records, De Jackie Inspirations. 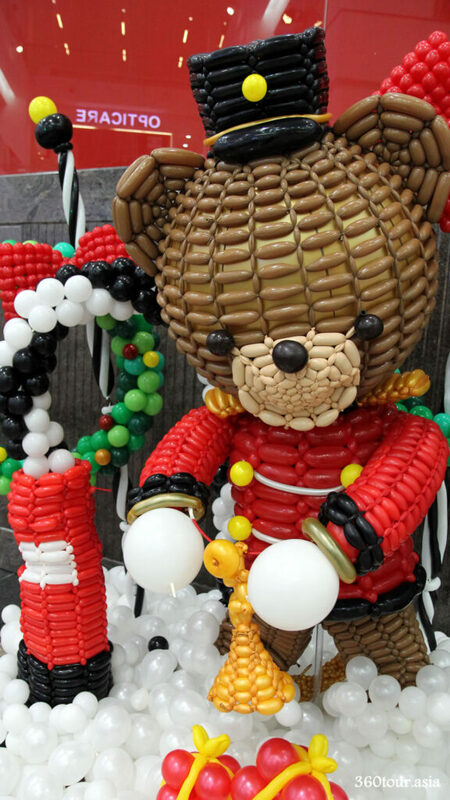 Balloon Sculpture is once known to be found in theme parks and circus, blown by clowns and given to children, can now being a serious business in the line of sculpture art. 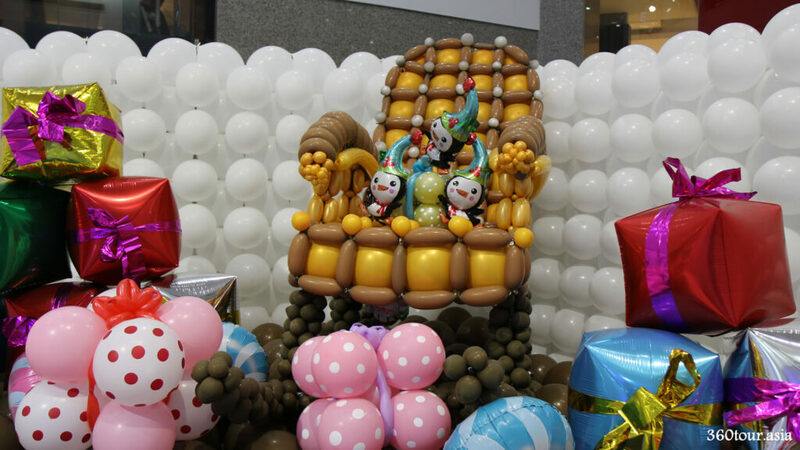 Special balloons are blown, shaped and grouped to form a complex artwork. De Jackie Inspirations and Boulevard Shopping Mall have collaborated to set another Malaysia Record for Malaysia’s Largest Landscape Made of Balloons. This year, they’re bringing your favorite fairy tale characters to life! The main stage of the Balloon Fairyland 2016 featuring towering castle background made of Balloons. Random Peeping Santa Claus balloon Sculpture. De jackie Inspirations is specializes in balloon decorations for all occasions. Balloon Decoration for Weddings, Birthdays, Corporate Events and more! The notable achievement of De Jackie Inspirations in recent years 2012-2015. And this year they had made it to be the official record holder for the Malaysia’s biggest Christmas themed maze of balloons. The Malaysia Book of Records holder of the Malaysia’s Malaysia’s biggest Christmas themed maze of balloons. Balloon Fairyland 2016 was brought to you by Jackie Tan (Director), James Lau (Creative Director) and other famous balloon sculpture artist from Malaysia, Taiwan, China, Vietnam, Singapore and Hong kong. Customers and Visitors are welcome to inquire or purchase special crafted balloon sculpture and artwork at the De Jackie Inspirations stall beside the Balloon Maze. This is a 3 minutes short video on the Balloon Fairyland 2016 Event at Boulevard Shopping Mall Kuching Ground Floor. The whole Balloon Maze is surrounded by 2 meters height of walls made of white balloons. The wall shield the bystander viewer from seeing the beautiful balloon sculpture in the maze. The maze layout is straight forward but with some corners where the themed balloon sculpture are. The ticket counter at the entrance of the balloon maze. Queuing up to buy the entrance ticket to the maze. The first Balloon Sculpture seen is Alice in Wonderland. Alice in Wonderland is also known as Alice’s Adventures in Wonderland, was first appeared as an 1865 novel written by English mathematician Charles Lutwidge Dodgson. It narrates the fantasy adventure of the girl Alice after felling into a rabbit hole. It was very famous in both genre of Literature and Fantasy and being all time favorite tale for most children, and was adapted into many comics, movies and publications. The character portray in the Balloon Sculpture is both Alice herself and the White Rabbit wearing a waistcoat and pocket watch, as appeared in Chapter one of the story – Down the rabbit hole. Alice in wonderland balloon sculpture featuring Alice and the White Rabbit. Side view of Alice in Wonderland balloon Sculpture. The huge flower with color of fantasy. Aladdin is a Middle Eastern folk tale, featured as one of the tales in The Book of One Thousand and One Nights (“The Arabian Nights”), which was known to be added in the collection by Frenchman Antoine Galland in the 18th centuries. The tale of Aladdin was closely related to the Magic Lantern which hold the genie of the lamp. It was later adapted into many plays, animations and televisions. One of the famous adaptations is American animated musical fantasy film in 1992 produced by Walt Disney Feature Animation and released by Walt Disney Pictures as the 31st Disney animated feature film. The balloon sculpture features Aladdin, Princess Badroulbadour, the magic flying carpet and the genie of the lamp, with the background of Arabic palace towers and domes. The Aladdin and the Magic Lamp Balloon sculpture. The Blue Genie of the Magic Lamp. Another view of the Aladdin balloon sculpture. Cinderella was also known as The Little Glass Slipper, is a folk tale with Thousands of variants known throughout the world. The oldest documented version comes from China. Although with many different names in different country but the main story-line lies in the tale of a young woman living in unfortunate circumstances, that are suddenly changed to remarkable fortune. The most popular version was first published by Charles Perrault in Histoires ou contes du temps passé in 1697. The popularity of his tale was due to his additions to the story, including the pumpkin, the fairy-godmother and the glass slippers. Cinderella was adapted in many theater plays, operas, books, songs, movies and television series. One of the well known version is a American animated musical fantasy film produced by Walt Disney in 1950 based on the fairy tale Cendrillon by Charles Perrault, and it is the twelfth Disney animated feature film. Featured in the Cinderella Balloon Sculpture is Cinderella herself in blue ball gown, the Prince Charming, the “golden” carriage which was known to be turn into carriage from pumpkin by the fairy godmother, and several pumpkins. It was also noted two mice wearing Christmas hats besides Cinderella, it was said in the story that the fairy godmother turn mice into horses. Cinderella and Prince Charming Balloon Sculpture. Cinderella, Prince Charming, the Carriage, and several Pumpkins (at the corner). A closer view of the Cinderella, Prince Charming and the Carriage Balloon Sculpture. Another view of the Balloon Sculpture. “The Little Mermaid” is a fairy tale by the Danish author Hans Christian Andersen, publish in 1837 and has been adapted to various musical theater and films. It was then popularized among the children with the adaptation into the American animated musical fantasy film produced by Walt Disney Feature Animation and released by Walt Disney Pictures in 1989, as the 28th Disney animated feature film. The Little Mermaid tells the story of a beautiful mermaid princess who dreams of becoming human. “The Little Mermaid” balloon sculpture features the characters in the Disney Animated film of 1989, Ariel the little mermaid princess herself with her best friends “Flounder” the bright yellow and blue colored tropical fish, and “Sebastian” the red Jamaican crab which is a servant of King Triton. The Little Mermaid Balloon Sculpture featuring Ariel, Flounder and Sebastian. A closer view of the balloon sculpture. Ariel the mermaid princess is the main character in the Disney Animated Film 1989 – The Little Mermaid. Some creatures of the sea, featuring a red lobster, red octopus and a basket of pearls. Frozen is a 2013 American 3D computer-animated musical fantasy film produced by Walt Disney Animation Studios and released by Walt Disney Pictures as the 53rd Disney animated feature film. Inspired by Hans Christian Andersen’s fairy tale “The Snow Queen”, the film tells the story of a fearless princess -Princess Anna- who sets off on an epic journey alongside a rugged iceman, his loyal pet reindeer, and a naïve snowman to find her estranged run-away elder sister -Princess Elsa- , who have inadvertently trapped the kingdom in eternal winter. Princess Elsa possesses cryokinetic magic which she can create snow out of thin air, froze bodies of water and create great ice castle. Fear makes her grow stronger and out of control but only an act of true love can thaws a frozen heart. The Frozen Balloon Sculpture features Princess Elsa of Arendelle her younger sister Anna. There are hanging snowflakes balloon hanging by fine nylon strings that makes it appears floating around Princess Elsa. Balloon Sculpture features Princess Elsa and Princess Anna from the film Frozen, standing side by side at the field of floating snow flakes. Snow White and the Seven Dwarfs is a 1937 American animated musical fantasy film produced by Walt Disney Productions, based on the German fairy tale by the Brothers Grimm. The fairy tale ranked the greatest American animated film of all time in 2008 in the American Film Institute’s list of the 100 greatest American films. It had a huge cultural impact resulting adaptation in many theme parks attractions and musical. The film had been re-release to theaters multiple time by Disney (1952, 1958, 1967, 1975, 1983, 1987, 1993) and latest restored in 1993. The balloon sculpture features Snow White and Seven adult dwarfs, namely Doc, Grumpy, Happy, Sleepy, Bashful, Sneezy, and Dopey. It also feature a wide open greenery with a huge full sized apple tree in the middle of the balloon sculpture. The apple tree plays an important part of the film as the Evil Queen creates a poisoned apple that will put whoever eats it into the “Sleeping Death”, a curse that can only be broken by “love’s first kiss”, and inevitable snow white have a bite as tricked and fall into eternal sleep until the prince who had previously met and fallen in love with Snow White kissed her and broke the curse. There is many wandering rabbits balloon sculpture, representing the animals who defended snow white and woodland creatures which keep watch over her for a year while she was in eternal sleep in the coffin. The Snow White and the Seven Dwarfs balloon sculpture as seen from the side with the huge apple tree at the center. 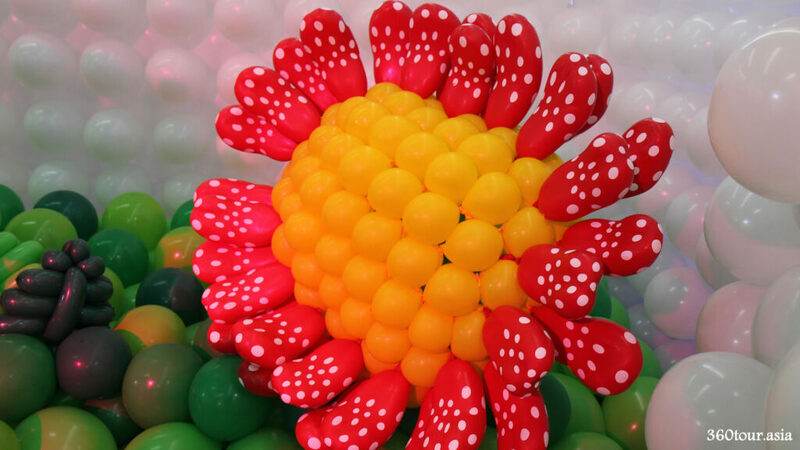 Huge Flower Balloon Sculpture with similarity to Borneo Rafflesia Flower. The wandering happy balloon rabbits on the huge mushroom and grassland. The cute and cuddly balloon rabbit. The Snow White and the Seven Dwarfs balloon sculpture. The balloon sculpture as seen from different angle. Visitors taking photos with The Snow White and the Seven Dwarfs balloon sculpture. The Gingerbread Man is a fairy tale about a gingerbread man’s escape from various pursuers and his eventual demise between the jaws of a fox. Its origin is unknown but may dates back before 1875 when the known first print appearance in “The Gingerbread Boy”. The Gingerbread Man remains a common subject for American children’s literature into the 21st century, with many different adaptations, with similarity story line of runaway food. The featured Gingerbread Man in the balloon sculpture is rather from a famous American computer-animated fantasy-comedy film – Shrek (2001). The live talking gingerbread man and one of Shrek’s friends, known as “Gingy” and was created by The Muffin Man. Peter Pan; or, the Boy Who Wouldn’t Grow Up is J. M. Barrie’s most famous work, in the form of a 1904 play and a 1911 novel. Both versions tell the story of Peter Pan, a mischievous yet innocent little boy who can fly, and has many adventures on the island of Neverland that is inhabited by mermaids, fairies, Native Americans and pirates. Captain James Hook is the pirate captain of the brig Jolly Roger, who is Peter Pan’s archenemy. He seeks revenge on Pan for having his left hand chopped off and fed to the Crocodile in fair battle. An iron hook replaced his severed hand, which gave the pirate his name. Later on was adapted into Peter Pan, a 1953 American animated fantasy-adventure film produced by Walt Disney based on the play by J. M. Barrie. It is the 14th Disney animated feature film. The balloon sculpture featured Peter Pan flying on top of the Pirate ship, Peter pan’s pixie friend Tinkle Bell, Pirate Captain James Hook and several Crocodiles jumping out of the waters. The jumping crocodile beside the pirate ship plays an important role in the beginning of Captain Hook. Peter Pan Balloon Sculpture as fly hanging from the ceiling. Peter Pan’s Pixie friend – Tinkle Bell Balloon Sculpture. The Pirate Ship Jolly Roger Balloon Sculpture. The Crocodile Balloon Sculpture is placed beside Captain Hook. The crocodile balloon sculpture wearing a Christmas themed hat. Pirate Captain Hook balloon sculpture standing on the rock formation surrounded by the body of sea waters. A close up view of Captain Hook Balloon Sculpture. In contrast to other fairy tales, The Pied Piper Legend may have some eerie background with strong relation with the tales of the missing children, that leads to many speculation over the years. The Pied Piper of Hamelin (also known as the Pan Piper or the Rat-Catcher of Hamelin) is the subject character of a legend from the town of Hamelin, Lower Saxony, Germany. The legend dates back to the Middle Ages, likely dates back to year 1284, the earliest references describing a piper, dressed in multicolored “pied” clothing, who was a rat-catcher hired by the town to lure rats away with his magic pipe. When the citizens refuse to pay for this service, he retaliates by using his instrument’s magical power on their children, leading them away as he had the rats. The earliest mention of the story seems to have been on a stained-glass window placed in the Church of Hamelin c. 1300. The window was described in several accounts between the 14th and 17th centuries before it was destroyed in 1660. The present-day City of Hamelin continues to maintain information about the Pied Piper legend. In 2009, Hamelin held a tourist festival to mark the 725th anniversary of the disappearance of the town’s earlier children. The legend had been adapted into many plays, novels and music. An American Pre-Code animated short film based on the story of the Pied Piper of Hamelin was produced by Walt Disney Productions in 1933 as a part of the Silly Symphonies series. In the balloon sculptures, it features the pied piper blowing a magic pipe, with many rats appears relaxing around the piper. The colorful rainbow colored wind mill and rainbow create a great contrast in the overall feature. The Pied Piper and the following rats balloon sculpture. Pinocchio is a fictional character and the protagonist of the children’s novel The Adventures of Pinocchio (1883) by Italian writer Carlo Collodi. Carved by a woodcarver named Geppetto in a village near Florence, he was created as a wooden marionette but dreamed of becoming a real boy. Pinocchio have tendency of lies and known by his nose which grows in length when he tells a lie. The story had been adapted into different media, however a more famous version is the American animated musical fantasy film produced by Walt Disney Productions – Pinocchio in 1940. It was the second animated feature film produced by Disney. Pinocchio was theatrically re-released in 1945, 1954, 1962, 1971, 1978, 1984, and 1992. Restored in 1992 and released in VHS in 1993, VHS/DVD in 2000, Blue-ray in 2009. Featured in the balloon sculpture are Pinocchio himself, and his conscience, Jiminy Cricket, a cheerful and wise cricket who would try to guide Pinocchio into the right decisions. The Pinocchio Christmas theme balloon sculpture. The Jiminy Cricket balloon sculpture. Pinocchio balloon sculpture wishing you a merry Christmas . Bunch of penguins on the lazy chair balloon sculpture. Pinocchio Christmas themed balloon sculpture is the last sculpture in the Maze. Upon walked out of the exit, a teddy bear balloon sculpture wishes you a merry Christmas. A Christmas themed teddy bear wishing you merry Christmas. A closer look at the balloon sculpture. Well costumed Santa Clause walking around the mall wishing children merry Christmas, bringing along small gifts and photographic opportunity. Group Photo with Santa Clause. Note: All Historic related description is adapted from Wikipedia.